Alaska is known as a rugged state that produces hearty specimen and good-natured people. The country is filled with wild beauty and diverse wildlife abounds throughout the year – even during the long winter months. Alaska might be the most Northern and largest state in the United States, but that did not stop these hearty residents from selecting a delicate and particularly sentimental flower as the state flower of Alaska. However the name originated, the posies of blue flowers with sunny centers are still a symbol of love and faithfulness today. For this very reason they are often include in a bridal bouquet and have been throughout the centuries. 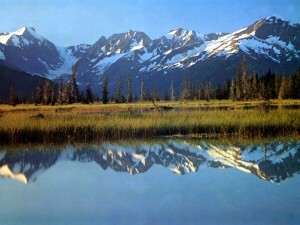 In Alaska, there is much woodland beauty with towering mountains and enchanting waterways. Perhaps, it is the simple blue flowers that give the most beauty to the wilderness. Could this be why such a determined state has selected such as lovely and tender blossom? 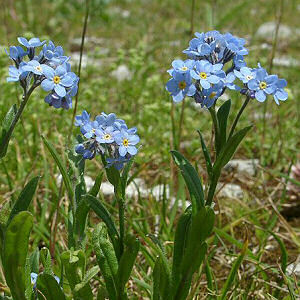 Forget-me-nots, or Myosotis alpestris, grow wild in cooler regions. You can grow your own forget-me-nots as annuals every year. Plant the seedlings in a lightly wooded area using plenty of compost to give the plants the rich organic soil they prefer. Water the plants evenly, and in the spring you’ll see a riotous mass of blue, white or pink blossoms throughout your trees. This entry was posted on Saturday, June 20th, 2009 at 9:48 am	and is filed under American Flowers. You can follow any responses to this entry through the RSS 2.0 feed.